Established over half a century ago, T J Davies & Sons Funeral Directors have served Newport, St Julians, Maindee and Old Barn Estate. We are based on Caerleon Road, just off junction 25 of the M4. 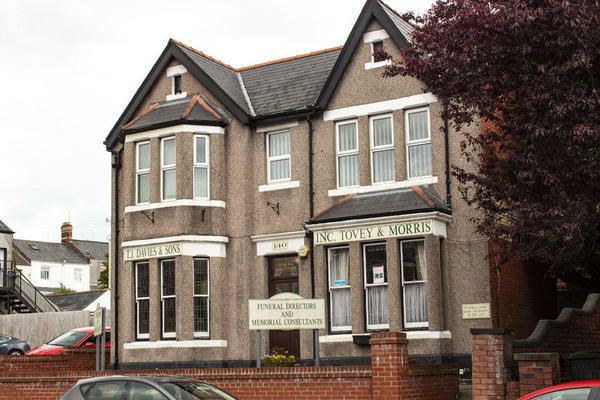 We have another T J Davies & Sons funeral home close by on Chepstow Road. We have a wealth of experience which we will use to listen, guide and assist you in saying goodbye in a dignified way. We understand no two funerals are the same, so we offer the opportunity for you to tailor your loved one’s farewell to make it a representation of their life. We never compromise on quality, which is why we offer an unparalleled standard of funeral care. It is our duty to care for you as well as your loved one; with that in mind, you can contact us 24 hours a day for support and advice. We are on the corner of Caerleon Road and Morden Road. Our staff are available 24 hours a day on 01633 267402 if you require our services outside of these hours. Very pleased with their service, and Joe who dealt with me initially was wonderful and was supportive right the way all the way through the process. The funeral director was very nice and he was so lovely at the service and the meeting before, the funeral. I am very appreciative for all of Joanne and Gareth's help with the planning and organizing of my Father's funeral. It was an incredibly smooth process and both Joanne and Gareth were constantly updating us from start to finish. Everyone was also very understanding and made sure I knew I could contact them at any point with any queries. Nothing was too much trouble. Joanne and Gareth's additional help with the British Nuclear test veterans flag was also extremely appreciated as this was last minute. I cannot thank everyone enough who helped. The arrangements of any funeral is not a pleasant event. There is so much Administrative work to complete when a loved one passes, so the support given by T J Davies helps enormously. Thank you for taking the time to complete the online review. I am pleased that all of the arrangements were carried out to your satisfaction and that we were able to provide you with the support and guidance needed. I couldn't recommend TJ Davies highly enough. Nothing was too much trouble, I felt looked after and supported every step of the way. Everything was explained sympathetically and every interaction with Anthony and the other members of the team was professional and compassionate. Thank you for taking the time to send your online review to us. I am pleased that you were so well looked after by our team during this difficult time and that we were able to provide you with the support and guidance needed. The service was first class from start to end. Nothing was too much trouble and our Mother's wishes were carried out to the full. We couldn't have asked for a better service. Thank you for taking the time to complete the online review. I am glad that all of your mothers wishes were carried out by the team as requested and that we were able to provide you with the care and support needed at this time. The service provided by your company was exceptional especially that of Ms Joanne Saville. She was truly compassionate, caring and dignified. She is truly a valuable asset to your company. Full marks for all aspects of your service. We'll done!!!. Best wishes Dave & Sue Venn. Thank you for the kind comments on your online review. I am pleased that we were able to provide such a high level of care and guidance at this difficult time and that all of the arrangements were carried out as you had requested.